In 1937 the British Battalion of the International Brigade fought in its first battle at Jarama against Franco's fascists. 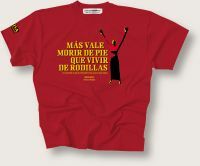 This superb T-shirt is based on the Battalion's banner from the period which was carried to Brunete, Ebro and elsewhere. Volunteers from Britain totalled 2,300, of whom 525 died in Spain. Unisex sizes small (36inch chest/90cms), medium (40inch/100cms), large (44inch chest/110cms) , XL (48 inch/120cms) and XXL (52 inch/130cms). PLUS! Women's fitted size 12, (34-36 inch chest /70-90cms). Available as listed in drop-down menu below.